I am British; I reside in the UK and we do not have many public service campaigns or advertisements for medical conditions or indeed medications. We differ alot in how we publicise and explain IBD to the United States. That being said, the new CCFA campaign “Escape The Stall” has been all over the social networking system and indeed in the American press: NY Times, I’m looking at you. Firstly, I appreciate an IBD campaign. And yes, alot of people have negative opinions towards these new adverts as they simply show IBD to be “just a pooping problem” and yes, that might not be everything IBD contains nor brings to mind. But, the reality is that we all poop. It’s the common theme we all share, IBDers or non IBDers; it’s nothing to be ashamed or embarrassed by, it’s a natural process of your body. Lots of Crohn’s and Colitis patients go through surgeries, were as some of them don’t. Others spend a significant portion of their time in the hospital, some don’t. Some have lots of medications to take and deal with their side effects, others don’t. Some have mild forms of their conditions, others have severe. Everyone is different when it comes to IBD. But collectively, we all poop. At some point, we all have issues with urgency, bleeding, flare ups and inconstancy. Most of all, we all share the embarrassment of needing the toilet at incontinent times and places. It is the nature of the beast, of the disease. Secondly, what exactly could have been used in a first public campaign? Scars? The variety of IBD medications, in all their glory? Hospital shots of patients hooked up machines? Does that really make people want to learn more? It is something we get used to as patients; the fact that we might have surgeries, and take more medications a day than we ever dreamed of, or be so weak in hospital we need TPN feeding. But to everyone else, it is shocking. It might be too shocking. Has the campaign been limited – at this stage – by the regulation of images? Does the CCFA plan to make the next campaign more “graphic”? Would this satisfy some people’s desire for the “real” IBD story to be shown? Thirdly, where is the gratitude? It shows a man with his young child, as they both sport no hair. He is obviously a cancer patient and survivor. 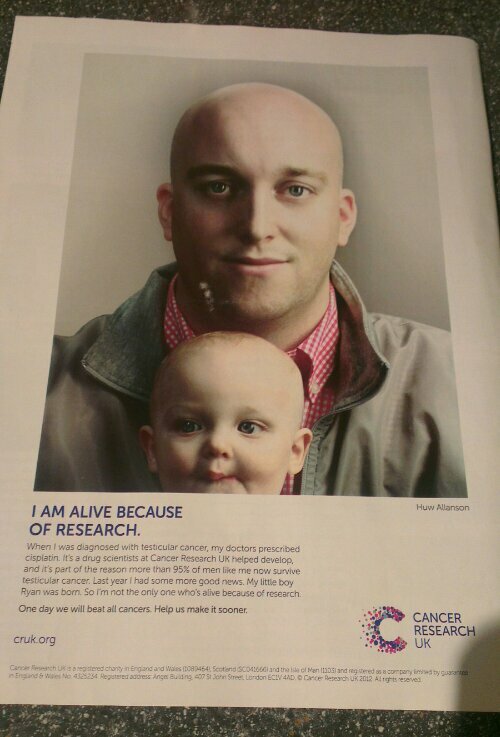 The blurb explains that the drug that helps him beat testicular cancer was developed with the help of CRUK and his son wouldn’t have been born last year without this help. I admire this campaign because it is real. It is not graphic nor too gruesome to be shown on the back of a national television guide. That is what I dream of for here in the UK. A positive campaign that can depicts the realities of IBD. I admire the guts CCFA had for making a national campaign about raising awareness of IBD and I hope they go forward to be able to show a more realistic representation of how it affects our lives. But here in the UK, NACC – The National Association for Crohn’s & Colitis – are working hard to raise funds for something like that, I hope. I think awareness is a multifaceted beast of a project and needs constant care, attention and new ideas thrown into it. At the very least, the negativity from IBDers could be focused and direct; to the extent that the next step would be to show actual faces of IBD patients, perhaps. I am proud of my Crohn’s. I would be proud of any scars I had on my body and any experiences I had. Because I’ve survived them. I am not hiding in the shadows fearing the next pill or bathroom visit or weak moment. I am living in spite of those. I would like to show my face to the world when it comes to the education of our diseases. Next Post “Remission” of Crohns Disease – Myth?